Volunteer Opportunities: Volunteer Visitors Needed! If you have an hour a week to volunteer to visit with a senior to read, walk or talk please contact our Volunteer Coordinators. Volunteer visiting is a support program which matches a volunteer with a senior who is isolated, lonely or could just use a friend. The client and volunteer meet on a one to one basis and visit in the client’s home. 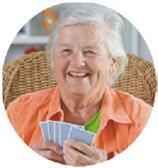 These regular visits can include a telephone conversation, or enjoying activities outside the home. Any seniors and adults with disabilities who live independently in the community are eligible. People of all ages experience loneliness. However, seniors are particularly susceptible for a variety of reasons related to the losses experienced in growing old. Alleviating the loneliness experienced by many seniors is an important step in improving their health and the quality of their lives. An intake will be completed over the telephone, and then the process of finding a suitable match will begin. There may be a wait list involved when registering as a client, as it is important that we find the right match for clients and a volunteer. Every effort will be made to match people with similar interests or backgrounds in order to give the friendship a starting base on which to build. While the client is on the wait list we may suggest registering for either our Diners’ Club or Telephone Reassurance to ensure that the client is receiving some social contact. All volunteers with ONE CARE Home & Community Support Services complete a screening process which includes a police check.